Nylog Blue renders a strong, flexible, lubricative glaze that never hardens, and always remains temperature and vibration resilient. A visco-elastic liquid derived from refrigeration grade lubricants, It bonds tenaciously to many different substrates. Typically, one drop of Nylog can be stretched about three feet before breaking. Use Blue Label with synthetic oil systems POE or PAG. The use of Nylog as the "seating compound", offers light compaction sealing with lubricity. 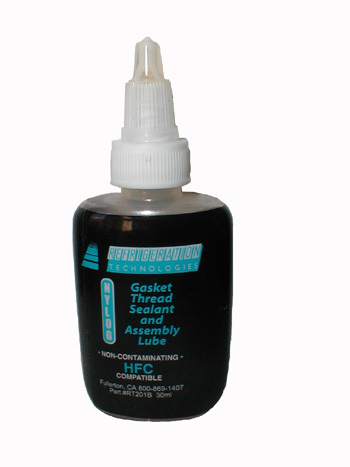 Contributes to the long term preservation of the gasket and further prevents the material from becoming brittle from extreme heat or cold over time. Helium leak testing of flares treated with Nylog were tighter than flares coated with a teflon membrane, resin adhesive, or silicone. Coated Schrader valve cores do not leak and their depressors remain lubricated.